I just got this ASCpro GoPro pole and love it. It’s a lot like a selfie stick. Just attach your GoPro to the end of it and you can extend the poles to get a super awesome shot. It’s 13.5″ without extension, 22.50″ with 1 extension, and 33″ with both extensions. The holder for the GoPro is very secure so you don’t have to worry about your camera getting damaged at all. The extenders work really well, extend smoothly and a easily. It has a strap you can fasten around your wrist so you don’t drop the pole. It’s a really nice high quality GoPro pole that made of great quality materials. Perfect for getting those action shots! All Aluminum GoPro Accessories Mount for Extra Strength and Durability. Perfect Fit for GoPro Hero 4, 3+, 3, 2, 1. 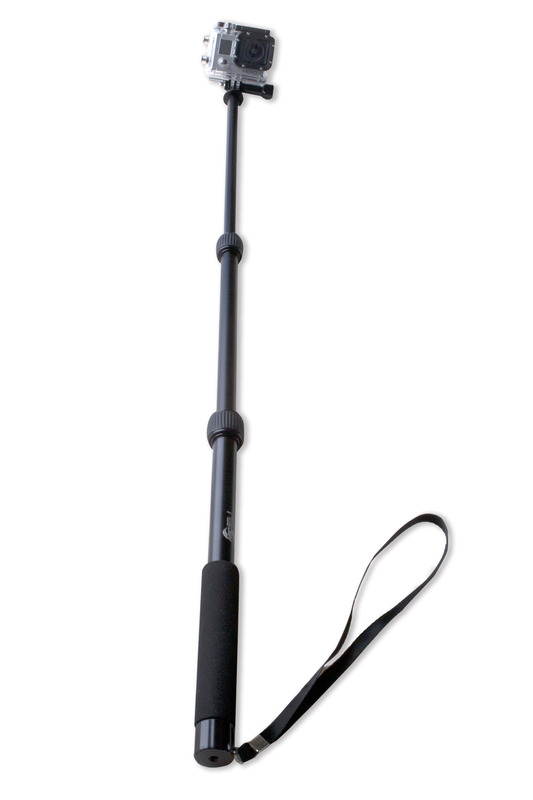 More Compact 13”- 33” 3 Section Telescoping GoPro Hero Pole. High-Grade Aluminum Twist Locking System. Makes this GoPro Pole Waterproof. GoPro Selfie Stick with Adjustable Wrist Strap and Tripod Mount with Buoyancy Control. Lifetime Warranty. If it Breaks then We’ve Got You Covered!